Uncheck “Formula Bar” and “Headings”. This will hide both formula bar and column / row headings from screen. Now press CTRL+F1. This will toggle ribbon to outline view. Bingo, you suddenly have 50% more space to show your spreadsheets. In Excel 2010 or prior, activate Full Screen mode from View ribbon. In Excel 2013 or above, use Auto hide ribbon option to mimic full screen behavior. So there you go, enjoy expanded excel estate. How do you display workbooks to colleagues? I use above technique in all my videos / online classes to showcase the workbooks. What about you? How do you display your workbooks in a meeting / presentation? Share your tips in the comment section. Want more quick tips? read on. In 2013 you can also add to the QAT the hidden command "Toggle Full Screen View". 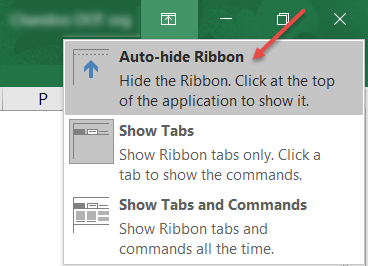 Instead of using the shortcut CTRL+F1, I prefer just to double-click one of the tab names (ie double-click the "Home" text on the Home tab) to enable the Ribbon Outline view. To return to the normal Ribbon state, just double-click your mouse again!